This is particularly apt. I feel she is still here but I just can't quite get to her. Especially on returning home from a few days away...in the mental picture you sometimes rehearse on your way home, she is there. But in reality she isn't. So, coming home was like losing her all over again. And now Jools is missing too. We haven't seen him since we got home. ha ha took me a moment to spot the dog! The bee home Jackie, they are for mason bees, non stinging bees that are good polinators for my veg bed. They reverse in lay and egg, pop some pollen in as food and then seal each chamber up with a mud seal. Then egg, pollen and so on they lay about 6 in each bamboo tube. Later to hatch as new bees:D They worked a treat last year we could see them collecting pollen from our veg flowers. I love your mirror!!! 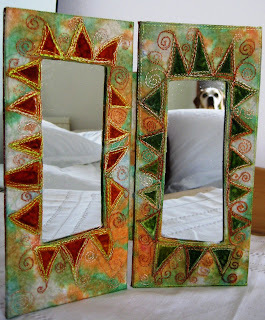 I used to make mirrors from papier mache and funnily enough just saw the one I gave my brother years ago the other day. It has a similar design on it. Re the neck wires. I was very naughty and paid shop prices for them instead of trying to source them wholesale. They are £1 each from Bead Crazy in Perth. I also got some at £1 each at a Bead Fair so that seems to be the going rate. These are cheaper but not quite as nice. The ones I use have a little ball at one end that screws off so you can add your beads or whatever. This one is just a hook. Great photo, yes, that's exactly how I felt last night. He should have been here...bouncing out with excitment, telling me off for going away without him, but,no. You are so clever at bringing together the sad and the humorous, making your posts about Willow so poignant. Has Jools come home? I am so sorry to read abowt yor doggy. The foto is very luvly cos it shows wat it's like wen yu looz a furry frend. Yu feel like they ar thare. I think sumtimes they mite be. Wen Mummy's cat Figs died, Granny kept seeing her shaype by the catflap, but then wen she lookt rownd at it it faydid away. i think they mite stay a littol wile to chek yu ar ok.
Figs's anniversery is this munth an it will be 4 yeers. Mummy still gets upset. So this yeer she is goin to put all her fotoes ov Figgy in wun album an rite abowt her thare. She sez it mite help. Maybe yu cud do the sayme for yor doggy. Or maybe that is wat this blog will be? I'm goin off now to reed the link yu sent me abowt a Bear!